Get sudsy with our handmade soap guide! With the many benefits that come with handmade soap, such as including organic ingredients that help nourish your skin, it’s no wonder that handmade soap has become a rising trend in our health-conscious world. 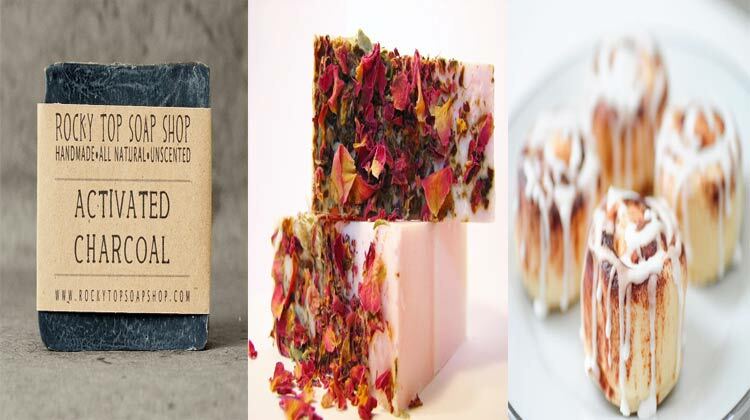 Crafted by skillful indie artisans, these handmade soaps come in various shapes, colors and scents, so find the best one for you and enjoy the wonders of organic, handmade soap bars. Since these soaps are professionally and carefully made, you’re ensured a high quality product that doesn’t contain chemicals that harm your skin. Instead, you get a refreshing and natural product that brings out your skin’s best appearance. Not only are handmade soaps organic and beneficial for your body, but they’re also easy on the wallet so that you can continue purchasing handmade soaps for life and never go back to non-glycerin, chemical-filled commercial soaps! Indulge in Mirasol Farm’s organic sample soap set! Made from rich and nourishing cocoa and shea butters and infused with hand-mixed essential oils, this soap set is a great way to sample various scents and find the perfect one for you. You can also use this sample soap set for traveling purposes, for guest bathrooms when you have family or friends staying over, for a simple yet delightful stocking stuffer or for adding to a bath & body gift basket. 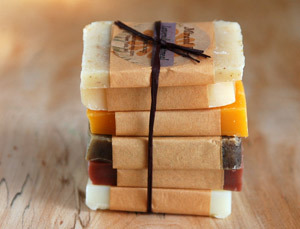 You can choose six different scents for this sample soap set. 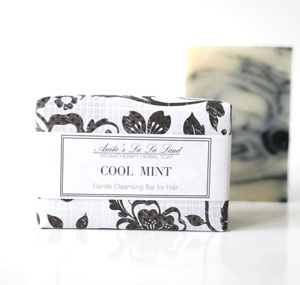 Have a refreshing shower with Anita’s LaLa Land’s cool mint shampoo soap bar! Made with peppermint and Japanese Camellia essential oils and menthol crystals, this soothing soap bar helps rejuvenate your senses, hair and skin. Perfect for normal-to-oily hair types, this shampoo soap bar features a black, swirly pattern that gives it a mysterious, artistic appeal. Find more soap bars for hair and body in Anita’s LaLa Land’s shop! 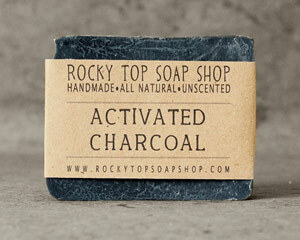 Rid your body of toxins with The Rocky Top Soap Shop’s bamboo activated charcoal soap bar! The activated charcoal in this soap bar draws out the toxins in your body and helps cleanse your skin. You can use this soap bar for your face or body or even both, making this soap bar economical as well as eco-friendly. Find more rejuvenating soap bars in Rocky Top Soap Shop. 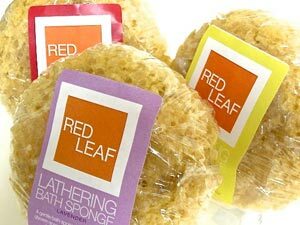 Clean and exfoliate your skin all in one with Red Leaf Bath & Body’s soap sponge! Drenched in olive oil and 5 ounces of Red Leaf Bath & Body’s own glycerin soap, this soap sponge includes natural ingredients that help your body rather than harm it. This soap sponge also makes for a wonderful addition in bath & body gift baskets. Express your love and attraction for your man with Plunk Soap’s Stud Muffin soap bar! 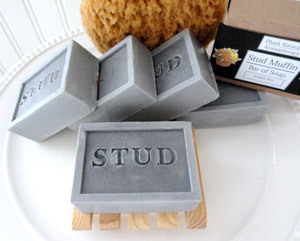 Imprinted with the word “STUD”, this soap bar has an appealing, manly scent made from a fragrant mix of spice and wood oils along with the slight scents of citrus and lavender. Made from glycerin soap, this soap bar contains zero additives and chemicals, making it gentle and healthy for the skin. The grey color of this soap also gives off a manly aura, perfect for your stud muffin. The Stud Muffin special scent blend comes in other bath & body products, such as shampoo and massage oil. 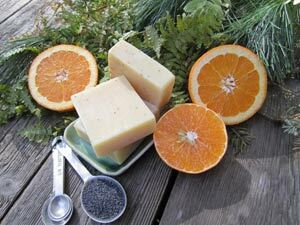 Envelop yourself in Wild Child Botanicals’ invigorating orange poppy seed soap! With a mix of oranges, tangerines and sandalwood, this fresh yet earthy soap is both refreshing for your senses and body. The poppy seeds mixed into this soap bar gives an extra, deeper cleansing for your body, perfect for getting rid of the day’s dirt and oil. Add a little romance to your bath times with DeShawn Marie’s rose soap bar! Made with all vegan ingredients, this lovely soap is also incredibly nourishing for your skin. With the infusion of fragrant rose essential oil, this soap bar is a unique Valentine’s Day present that you can give to your special lady instead of a typical rose bouquet. 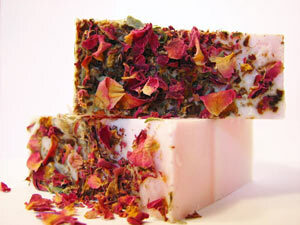 This soap bar has a topping of dried rose petals, making it more enchanting and romantic. Sweeten up your shower with Love Lee Soaps’ cupcake cream fluff soap! This fluff soap is an extraordinary twist on traditional soap bars that provides a fun way to try something different for your showers. Not only that, but this 8-ounce jar of fluff soap also lasts longer than regular soap bars. 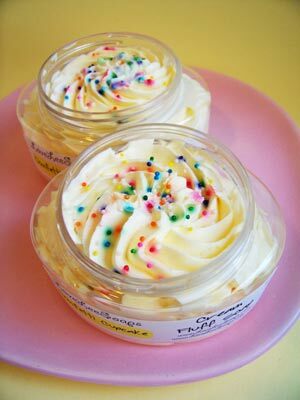 Mixed with colorful sprinkles, this indulgent cupcake cream fluff soap is a delicious way to enjoy favorite sweet treats as you shower or bathe! Ever been told to take a chill pill? With My Creative Clutter’s chill pill soap, now you can! Relax with this scrumptious, sugar cookie scented chill pill soap during your next bath or shower. Made with mango and shea butters, these chill pill soaps are revitalizing for your skin as well as sweetly aromatic. 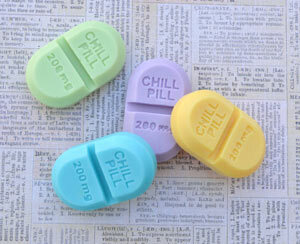 This listing includes four chill pill soaps, which weight 1 ounce each. Have dessert during your bath time with Aubrey E. Apothecary’s cinnamon bun soap set! 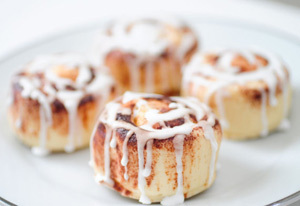 Scented with cinnamon bun fragrance and mixed with real cinnamon, these realistic, mouthwatering cinnamon bun soaps are almost good enough to eat! (Please don’t eat them if you do decide to buy them!) Along with the amazing scents of these cinnamon bun soaps, they’re also beneficial for your skin as well since they’re made with natural ingredients. This listing comes with two delectable cinnamon bun soaps, perfect for a gift for a sweet tooth friend or a couple’s gift for an anniversary. Handmade soaps can become great gifts for your friends and family, not only for yourself. You can add these naturally made soap bars from indie sellers into stockings during Christmas or as part of flourishing and vibrant gift baskets for birthdays or baby showers. With the benefits of using handmade, organic soaps, share them with your loved ones as special gifts for special occasions!